John Lydgate (c.1370-c.1450) was probably born at Lidgate in Suffolk; he became a monk of Bury St. Edmunds aged 15, a priest in 1397, and during a long life was a remarkably prolific writer of English verse. This manuscript was written and illuminated in two stages: heraldic evidence suggests that it was begun around 1460, but many of the spaces left for miniatures were left blank. About 60 years later, c.1520, the blank spaces were filled, and further Lydgate texts were added at the beginning and end. 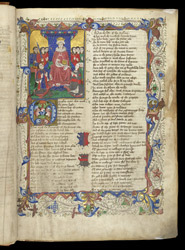 The original 15th-century part of the volume opens with a miniature of Sir William Herbert and his wife Anne Devereux--identifiable by the heraldry on their clothes and between the columns of text below--kneeling before an enthroned king, probably Edward IV, to whom they seem to be presenting themselves as faithful subjects.